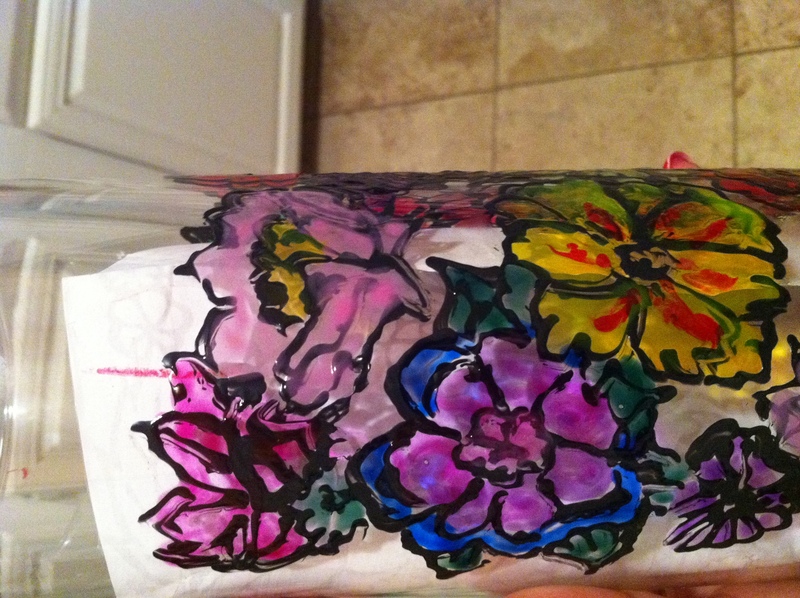 Starting off the “Jars of Lady B”** project, I went easy and used glass paint on them. As Madge pointed out in the comments, a much more AWESOME medium would have been Liquid Rainbow, but it’s been discontinued. 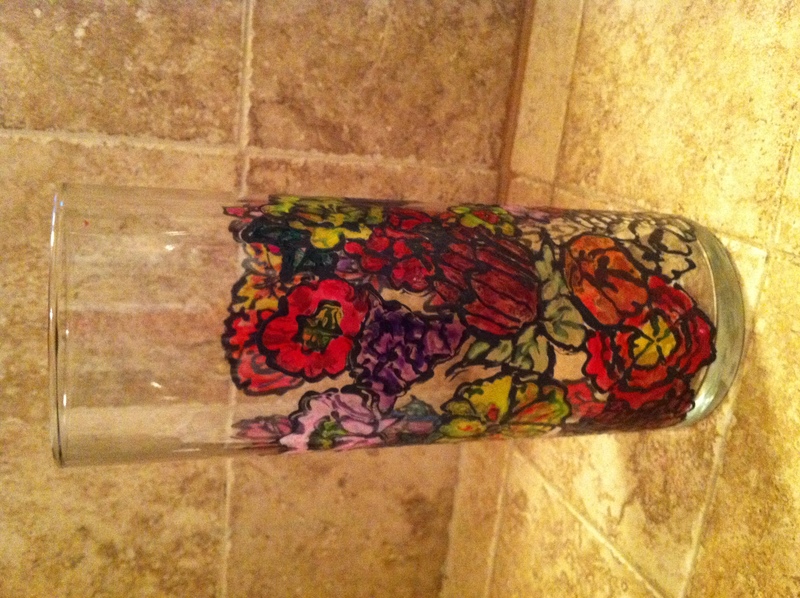 *sniff* So I made do with a glass painting set. I used designs from Carlton Hibbert’s pattern site as a template, but that didn’t work out quite as well as I wanted. I had to cut the stencil in sections to get it to stick to the properly, which was fine but a pain. Also? Spilled glass paint on a shirt will not come out. Don’t even try. 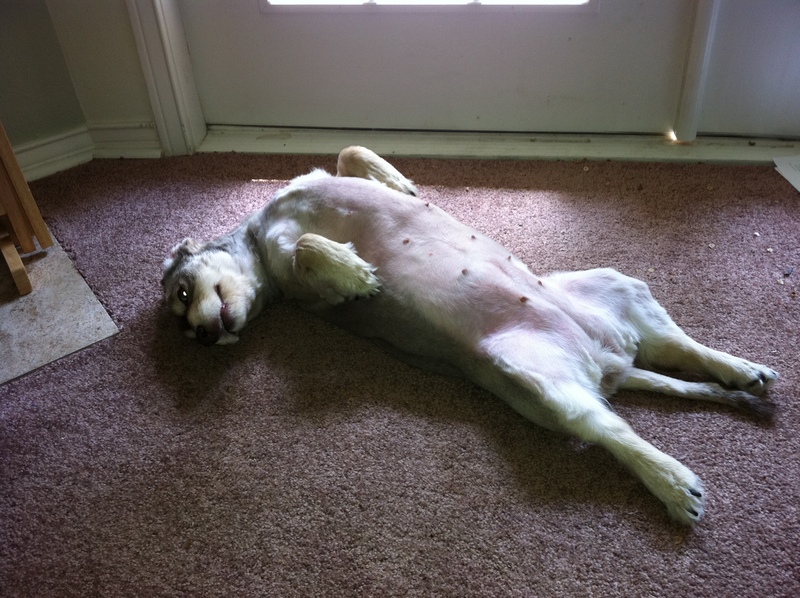 Maggie does not care about painting. 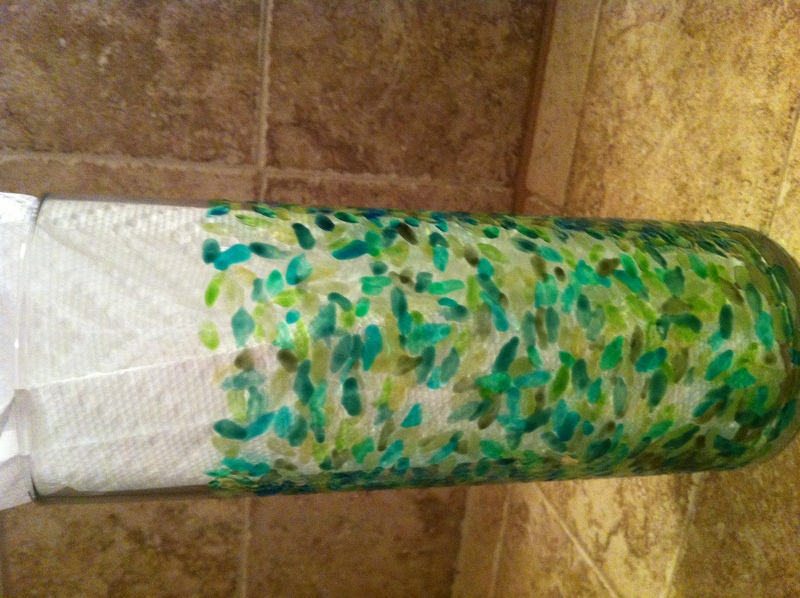 I used several different shades of green, trying to look like leaves. They look like fish to me actually…. Also, the blank spot at the top is where the stencil stopped. But I’m going to pretend I meant to do that and call it art. Also, apparently you can’t just dump the glass paint over the outline and just smear it around. I got a little lazy towards the end, can you tell? 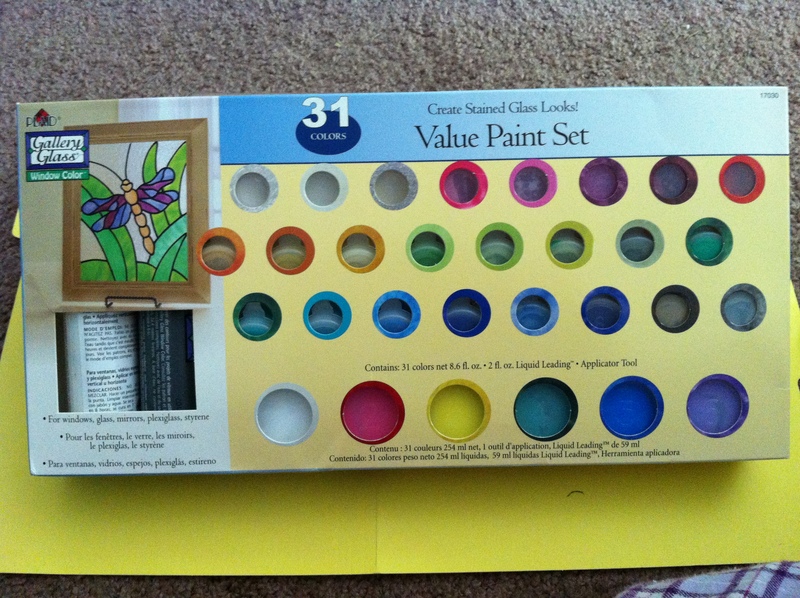 I’ve also realized I have little to NO artistic talent with painting. Which BLOWS because that’s one of the things on my Life List. Gonna have to work on that…take a class maybe. After my knitting classes. So my first try is less of a success than anticipated. 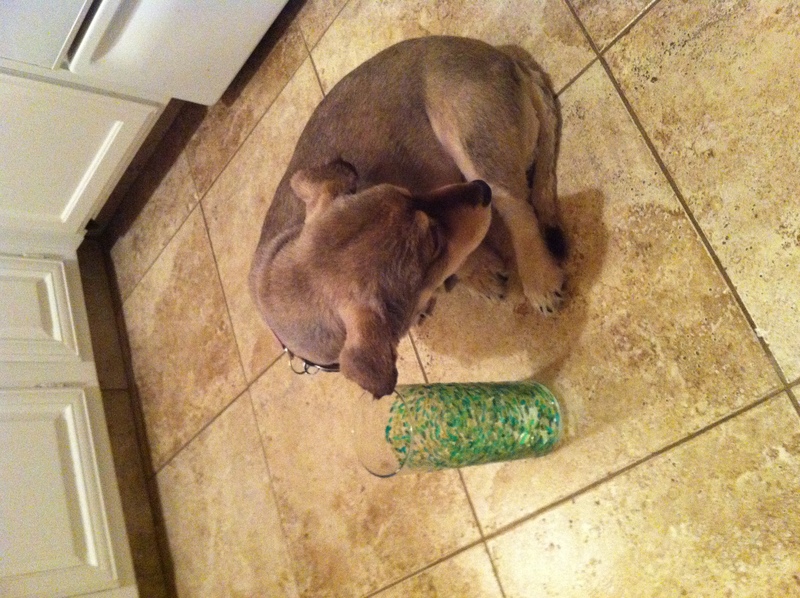 Maybe I should try jello next…. ** Lady B is my sister-in-law. 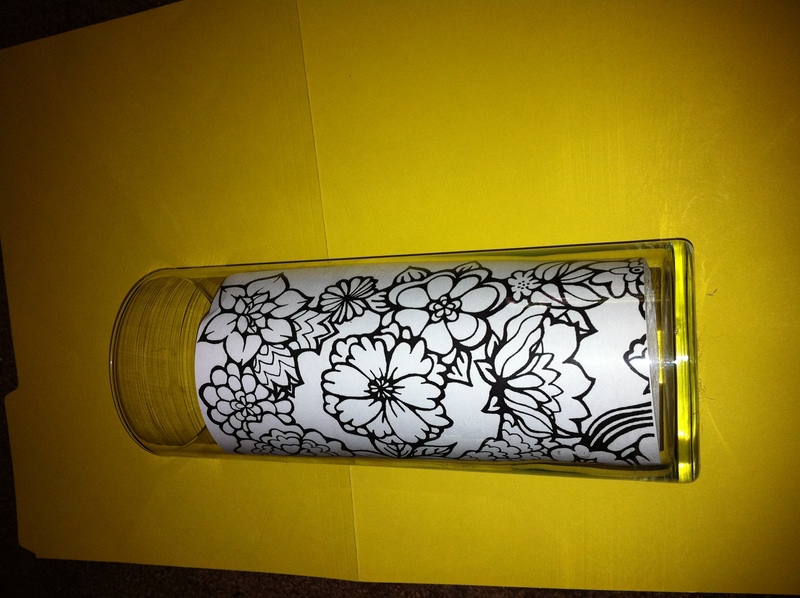 Calling them the “glass vases I got from my sister-in-law who got them at Hobby Lobby” didn’t have the panache. May 11, 2011 31 Comments Short URLcrafts, DIY, glass vase, paintingCrafts 'n such, The Jars of Lady B.
Jethro will totally not let me eat out of these. As an environmental scientist, he will start screeching about food-grade containers and lead and histoplasmosis… It’s the same reason that if I ever try to make macarons and their aged egg whites, he might divorce me. However, I do plan on getting a mess of gelatin and food coloring and expereimenting. There will be a dinosaur involved. actually, i think they’re cool. the green fish one especially. from an initial glance at the post, i thought the blank section was intentional. glass paint is, as we’d say in ireland, a pain in the hole. the leading gets wodged up (technical term) in the tip and poking about with a needle to make it clear is never entertaining. at least you didn’t schmear it. that is heartbreaking after spending 45 minutes being super über careful and then, whoops, slip of the hand and you’ve decimated it beyond repair. so, to recap, YAY! TWO VASES! and anyway, art is kinda like the first pancake rule: the first one is expected to be delicious, but funky. also, this has nothing to do with glass paint, but having written “pain in the hole” it then made me think of the quaint expression we have “go hang it off your hole” if someone says anything that annoys you. ironically, this isn’t a mjaor insult. Not only have you given me two new Irish phrases and a new word that I might start using immediately, you’ve introduced me to the “pancake rule.” I must start incorporting this into my life. Does it apply to kids? Cause I’m pretty sure we might mess the first one up…. Plus, you’re Irish. I have a VERY Irish married name and I’ve been informed that we love all things Irish. Although, we’ve been doing research on Ancestry.com and I have serious reason to believe that the Irish part of my husband’s family is actually Swiss. Just in case you were wondering, the pancake rule ABSOLUTELY applies to kids. I’m the oldest, and I can speak from experience. i apply the pancake rule anywhere i feel it would make me feel better about something that’s a bit iffy first time round. Irish-ness is great. man, we got EVERYWHERE the last few centuries. the swiss are good, but they’re no irish. they do excellent clocks and chocolate though. we got whiskey and potatoes (although, actually, thinking about it, those are both pretty wonderful also). We’re not a brilliant nation for record keeping at times (no one knows when my gran or any of her family were born because the church that held the records was either burnt or flooded. she used this excuse to have two birthdays, like the queen) it could be that Jethro’s family had a similar fate and irish records were lost after they went to SWtizerland (where they are VERY good at documentation) and that’s why it stops in switzerland. If i spin that out long enough would that make him feel better? SEE?!? His sister pointed all that out – cheese, chocolate, clocks, knives; the Swiss are good for many things! And it would, the turd. I think he just doesn’t want to have to throw out our coat of arms that we’ve got hanging up…. I really like the green one, ESPECIALLY the blank at the top. What do you mean you didn’t mean that to happen? Balderdash! You did, and it looks good. I like the green one a lot actually! I wish I could paint too. My grandma is an incredible painter, and I always wanted to be just like her, but it’s a no go. I dated a painter. He was a horrible human being but a startlingly good artist. It was so not fair…. I’m with Ali — you are way to hard on yourself. I think they look cute. Sure they don’t look like something perfect that was mass produced, but isn’t that the whole point. You should be proud of yourself for doing something creative. And with practice you’ll get better. 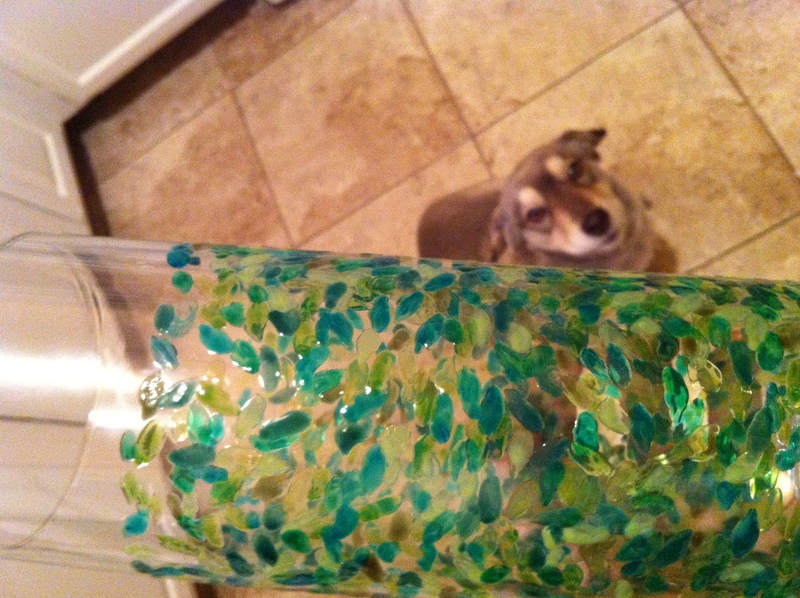 At first glance, vase number 1 made me think of bluebonnets. perhaps I’ve been away from Texas for too long. Either way, I like ’em. And I think I really like the pancake rule. I might need to embroider the pancake rule on a sampler…. And I get teh bluebonnet thing! Though they look less like the actual ones and more like what people paint on the sides of galvanized steel buckets and then sell for $80 in souvenior shops…. You say that now, just wait until I box all of them up and send them back to you…. I’d like to put an order in for one of them green fishy ones – it’s awesome! Especially with the blank space at the top, totally adds to it. Yay for unintentional artistic success! Don’t say that, because Jethro is gonna be looking for a place for me to put these things when I get bored; he’ll find your address and make you keep it. He’s handy on the internets…. i love the first one! they turned out great, alyssa, you’re being too hard! I think everyone else will like them better than you do. 🙂 I think they’re quirky and lovely and colorful and GREAT! ok I’m a bit behind on some commenting, sorry this is out of the blue at this point but I have to say WOW! I’m really impressed with the time and effort you put into these. definitely one of those projects I would buy the supplies for and then let it gather dust in some corner. so way to follow through! I really like the fishy/leafy one, rill pretty! I actually like the other one too, maybe put it somewhere it’s really only viewed from a distance..? ha. I’m looking at these and thinking, “nice!” – I think you did a good job but I have zero artistic ability & I majored in it in high school, all four years. Had teachers bartering with me – allowed me to submit poetry in exchange for several assignments… now you KNOW that’s gotta be pretty bad. Looking for a new or used auto can be quite a tough process if you do not know what you are actually performing. By teaching yourself about auto store shopping prior to visit the dealership, you can make issues simpler yourself. The following advice will help your upcoming purchasing trip be more pleasant. Usually provide a auto technician together when shopping for a new car. Auto merchants are popular for offering lemons and you do not wish to be their next patient. When you can not obtain a mechanic to think about automobiles with you, no less than ensure that you have him evaluate your ultimate choice prior to buying it. Know your limits. Before starting purchasing for your forthcoming vehicle or van, make a decision what you can manage to pay out, and follow it. Don’t overlook to add desire for your computations. You are likely to spend close to 20 % as a down payment as well, so be prepared. Just before going to a dealership, know what type of motor vehicle you want. Investigation each one of you options before store shopping to help you figure out what works the best for your financial budget and loved ones requirements. Do your homework to determine just how much you ought to be paying for any probable auto. Before signing any commitment take time to read through every collection, like the fine print. If there is nearly anything listed that you simply do not understand, do not signal before you receive an answer that you simply recognize. Unsavory salesmen are able to use a contract to place many service fees which were not reviewed. If you maintain the preceding assistance under consideration the next time that you just go purchasing a vehicle, you may be very likely to get a full bargain. Investing in a car lacks to become a headaches. Simply use the guidelines using this report and you will receive the vehicle you want at a good cost.